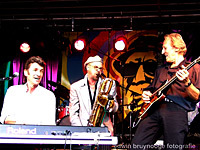 The VandeVen Band is one of the most authentic Rhythm �n Blues bands in Holland. Since they first got together in 1999, they have quickly gained a reputation for themselves with their energetic live-performances. Central figure of the band is the charismatic pianoplayer / singer Clemens van de Ven, who gives the band its special flavour with his characteristic, raw vocals and his powerful piano style. Clemens is accompanied by some of the top musicians in Holland. On guitar Harry Hardholt, Arend Bouwmeester on hornz and percussion and the beat is supplied by experienced Croatian drummer Sin Banovic. Ticket to Paradise, Off the Road and a live CD called Live In Austria. A brandnew CD is planned for release in early 2007. VandeVen is a regular guest at famous Dutch festivals such as: The North Sea Jazz Festival, Oerol and The Parade. They have also toured abroad in France, Austria, Spain and Egypt! VandeVen is a band that plays with heart and soul. They live for their music and they keep the music alive!